When St. Peter’s Church in Canton, Ohio, needed renovation, they decided to go first class. They approached Stromberg GFRC for help realizing their vision. Stromberg GFRC cast over 3,000 pieces for this project. The challenge with this renovation project was to match the color and texture of the existing church. The new pieces had to blend in so the renovations were not immediately obvious. Fortunately, GFRC can be textured and colored to meet practically any surface. All 3,000 pieces, including the large rose window, were cast and installed by Stromberg GFRC. The result is a church that looks loved without the newly installed pieces sticking out. This forms a harmonious blend of old and new. Many churches find themselves in need of renovation. Old church buildings may be missing bricks, have cracked or missing figures, and generally need to be restored to their former glory. Stromberg GFRC can help by precisely matching the texture and color of the old piece and replacing it with the matching GFRC cast. Historical preservation restrictions allow Stromberg GFRC to be used in this manner in restoration and conservation events. This means your building will not lose its historic status. Need Help With Your Historic Restoration Project? Stromberg GFRC offers turnkey service in this area. 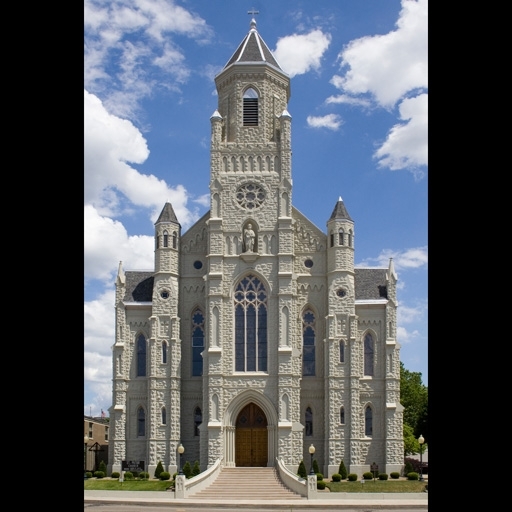 We design, cast, and install the item or items you need to replace to restore your church. For more information and assistance with your design challenge, please call us at (903) 454-0904 today or email us at info@strombergarchitectural.com.